Wednesday–Friday, 10 a.m. – 5 p.m.
Saturday–Sunday, 11 a.m. – 6 p.m. 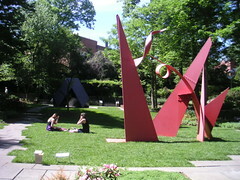 The Sculpture Gardens close during inclement weather. 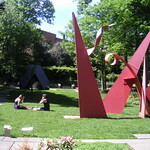 Public events include Summer Jazz in the Sculpture Garden concerts. The Sculpture Garden at the BMA deserves a Baltimore Green Map nomination because it is a private (meaning secluded, not closed to the public), shaded space in the heart of Baltimore City in which to view not only art (much of which references nature and animal life), but also a wide variety of plants, flowers, rabbits and birds. make the garden beautiful and it is a beautiful place.